The Connecticut State Legislature is in full swing now with its adjournment deadline rapidly approaching. The legislature has until May 4th to complete its duties. As previously reported in this column, the budget is the big issue this year. The Governor is sticking with his plan to reduce the state workforce by layoffs and attrition and by reducing the budgets of state agencies and state services. By now most bills will have been through their public hearings and moved on from their committees to the General Assembly. The State Grange has so far submitted testimony on four different bills and has expressed support for two more. Testimony was submitted to the Legislative Agricultural Committee in support of Raised Bill 76, An Act Concerning Connecticut’s Farm to School Program. This bill encourages food service management companies submitting bids or request for proposals (RFP) to local school boards of educations for school nutrition programs to include details on how they would purchase food from local farms to be used in their meals. Any proposals that promotes the purchase of local farm products in their proposals would also be given preference in the RFP or bid process. As of this writing this bill has been placed on the Senate calendar for a vote. Supporting testimony was has also been submitted on Raised Bill 5383, An Act Concerning The Farm Viability Matching Grant Program And The Connecticut Farm Link Program. This would create a program within the Department of Agriculture to connect people who have farmland they wish to sell with those who are seeking land for farm operations. We also submitted testimony on two similar bills which seek to amend the state constitution concerning property held by the state. Senate Joint Resolution 5, A Resolution Proposing An Amendment To The State Constitution Concerning The Environment And Natural Resources Of The State concerns easements held for conservation purposes. These lands cannot be used for other purposes or disposed of except by approval of two-thirds of the general assembly. Similarly Senate Joint Resolution 36, A Resolution Proposing An Amendment To The Constitution Of The State To Protect Certain Property Held Or Controlled By The State For Conservation, Recreation, Open Space Or Agricultural Purposes expands SJR 5 a bit to include lands held in easement. This would require a public hearing before the selling or transferring of state property to another person or entity. Then the transfer would have to be approved by the General Assembly by a two thirds vote. 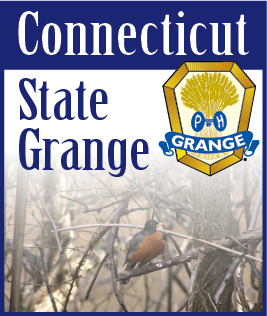 The Grange also expressed support but did send in testimony on, Raised Bill 5150, An Act Concerning Tree Wardens Notices on Trees and Shrubs Prior to Removal. This would require notifications be placed on trees and shrubs prior to removal. Also supported was Raised Bill 5151, An Act Concerning the Authority of Animal Control Officers in Common Interest Communities. This would allow animal control officers with the authority to enter common elements of common interest communities in order to carry out their duties.